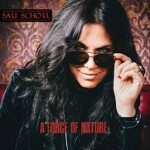 Share the post "Album review: SARI SCHORR – A Force Of Nature"
This interview was first broadcast on Get Ready to ROCK! Radio, Sunday 28 August 2016. Pete Feenstra chatted to Sari Schorr about her music and played tracks from her debut album. ‘A Force Of Nature’ certainly lives up to its title, as it bottles Sari Schorr’s emotional power and passion, while The Engine Room provides the power and adrenalin. Together they generate kind of intensity that producer Mike Vernon probably heard in the younger Clapton. The end result is an album with real vitality, freshness and spark, voiced in songs with enough emotional depth and intensity to make an enduring impact. From Innes Sibun’s opening guitar figure and Sari’s Tina Turner style vocal on ‘Ain’t Got No Money’ to the book-ended ballad ‘Ordinary Life’, Sari’s vocal fills the room with real emotional presence and understated power. Innes Sibun provides enough big toned guitar breaks alongside tasty contributions from Oli Brown to underpin both the rock and blues elements in the music. If New Yorker Sari has finally found her niche across the Atlantic, then her co-pilots guitarist Innes Sibun and Mike Vernon also have good reason to consider the project a rebirth. Innes was always the explosive guitarist with a limited vocal range, while Mike Vernon – recently rescued from semi retirement – has also found a way back, and this album has his signature stamp all over it. There’s clarity, subtle dynamics and excitement, as the trio pull together something magical from their combined musical pasts to make the kind of musical statement that will surely make a splash. On top of that there’s also a meeting of minds between Sari and Walter Trout on one of the Walter’s very best songs ‘Work No More’. It’s got the kind of observational narrative that fits perfectly with Sari own songs, while Walter pours all his soul into his solo. Mike Vernon also throws her a wild card in the shape of the Holland/Dozier/Holland penned Supremes classic ‘Stop! In The Name Of Love’. It may be a long shot for the radio, but if the Zeppelin style bombast of the current single – a cover of Lead Belly’s ‘Black Betty’ – takes off, then you can almost feel the pieces of the jigsaw falling into place. ‘A Force Of Nature’ isn’t a perfect album – Mike Vernon almost said as much in referring to the immense potential of the follow up – but when Sari’s voice soars, the band sparks and the hooks kick in, you can feel a band shaping the blues to it’s own end. Where Sari has spent a significant portion of her career gaining plaudits for her voice, ‘A Force Of Nature’ channels her emotional connection with the material into spacious arrangements that raise the bar. It’s her lyrics that set her apart from her contemporaries. On ‘Damn The Reason’ she digs deep for her meaning, while she’s not afraid to be autobiographical, as on the reflective and self affirming ‘Cat & The Mouse’. But perhaps the defining moment comes on the heartfelt ‘Letting Go’ a song about Mike‘s late wife which makes the sort of emotional connection between performer and producer to push the song to its limit. The closing ballad ‘Ordinary Life’ might fall between the cracks of radio potential and being a live song, but it’s shot through with naked honesty as she balances out her own impulses to show that she’s capable of meditative balladry as well as blues shouting. ‘A Force Of Nature’ is a slice of polished blues-rock with just enough lightning in the bottle to crossover from blues to rock fans. The combination of Sari’s booming vocals, her heartfelt songs and the band’s intense playing is given all the headroom it needs by Mike Vernon’s organic production which allows the music to breathe as only blues can. This entry was posted in ALBUM REVIEWS, ALBUM REVIEWS (Mobile), All Posts and tagged A Force Of Nature, album, blues, Eric Clapton, guitar, Holland/Dozier/Holland, Innes Sibun, interview, Janis Joplin, Lead Belly, Led Zeppelin, Mike Vernon, Oli Brown, review, rock, Sari Schorr, The Engine Room, The Supremes, Tina Turner, vocals, Walter Trout. Bookmark the permalink.